Update: fields at St Justinian are now open throughout the school summer holidays for visitors to park. Please check for signs when you are approaching St Justinian. Pembrokeshire Coast National Parks Planning department closed the previous parking field at St Justinian while discussion continues towards a long term sustainable solution. RNLI and Ramsey Island visitors, kayakers, leisure sailors, hikers, dog walkers and of course boat passengers have therefore had to adapt to temporary arrangements, a mixture of buses and parking fields at St Justinian. 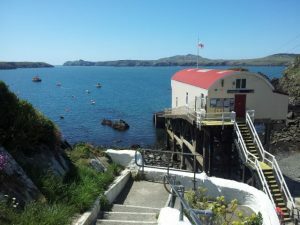 During the main summer season the plan is to open parking fields at St Justinian to ease the pressure on the buses, which while they may cope with coastal path hikers cannot be expected to cope with the numbers of visitors to the RNLI lifeboat station, Ramsey Island and boat trips and which were naturally never designed to cope with kayaks and sailing kit. The National Parks Authority has asked boat companies to flag up the Celtic Coaster bus service, which runs every hour in the shoulder season and every half hour in main season. To use this service they suggest you park at their visitor centre in St Davids. The fee is £3 for up to 3 hours and £5 for 3 hours and over. The bus fare is £1.50 each way per passenger. If there is no space in the visitor centre car park (which is open for use by anyone visiting St Davids) there is a turning circle at the end of the road at St Justinian so drivers can drop their groups off and drive to Porth Clais car park and take the bus from there. Dogs are allowed 'at the driver's discretion' and only if they are clean. Sadly the buses are unable to take bikes. Groups of 8+ are asked to contact the bus company in advance. The buses will continue over the summer period on the hour and half hour and the plan is to make fields at St Justinian available for parking on a temporary basis to cover the busy summer period and ease pressure on the buses. Do please allow plenty of time to get to St Justinian. It's a lovely spot but the roads are narrow and traffic can move slowly, especially when buses and caravans or tractors meet 🙂 . Of course we are fortunate in that we can also operate from Whitesands beach which, like St Justinian, is 10 minutes' drive from St Davids. Shearwater is the only local boat able to operate safely from the beach. The key is in part her shallow draft hull, which can operate in just 18 inches of water, coupled with her lovely Hamilton jet, which gives her the ability to spin so well but is also key in maximising control when coming in to anchor and has the huge safety advantage for surfers and other water users of having no propellers. We've been running jet boat trips from this beach for well over 30 years and it is a stunning location. Whitesands has a substantial car park, toilet facilities and a shop. It's a blue flag beach with lifeguard cover and some stunning coastal walks. It really is a great place to spend the day whether you're into surfing, swimming, rock pools or just enjoying the sunshine with a good book. We choose departure points primarily on the basis of safety and passenger comfort - weather and sea conditions - but also according to which departure point is likely to give the best passenger experience. We do our best to update passengers on weather, sea state and logistical issues such as traffic and parking so for passengers' convenience we ask for contact telephone numbers when confirming bookings. Whichever departure point we use we ask that passengers arrive in plenty of time so that they can relax and enjoy our glorious coast rather than rushing to the boat. 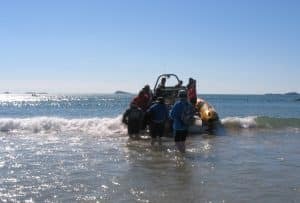 Their job is to arrive at the departure point in plenty of time, ours is to do everything we can to give them a safe and really enjoyable jet boat trip. If the early part of this season is anything to go by, this partnership is working really well. Thank you guys for helping us to keep everything running smoothly.